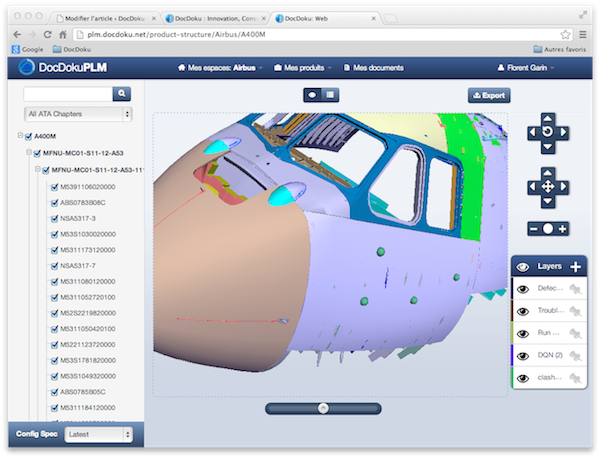 We have just implemented a great new functionality that allows to perform real-time product design review on the web. Basically it works like a screen sharing application but in reality it is much more than this. The feature is highly scalable, can easily manage room with several people and obviously is developed only with web technologies and hence no plugin installation is required. Moreover the module offers all the security we can expect: the meeting attendees will never see parts which they are not allowed to see. Trackball mode is mostly used when we want to examine a manufactured product of medium size. In this mode the camera targets a fix point. Use the wheel (or swipe down and up two fingers if you have a trackpad) to zoom in and out, right clic to rotate the product (actually that’s the camera which moves around) and the left click to move the object (in reality to slide the camera). The Free flight is perfect to navigate inside a huge product (like a cruise ship, a building or an A380). This mode works exactly as if we were inside a FPS game like Quake. Use the keys up and down to move forward and backward, the keys left and right to strafe and ‘R’ and ‘F’ to go up and down. At last, use the mouse, keep the right click pressed, to rotate the camera on the selected point. Don’t hesitate to test it on our public cloud docdokuplm.net with user ‘demo’ and password ‘demo’. Once logged select ‘Bike’ product then check the main part on the left. 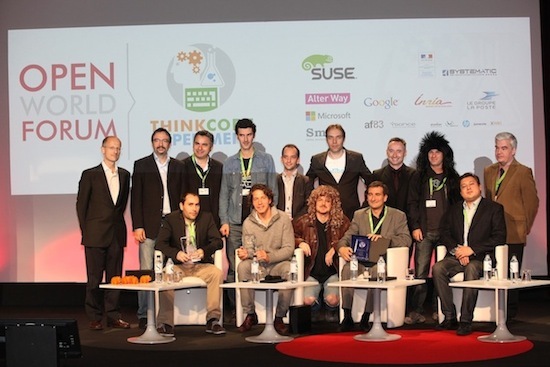 That’s with a great pleasure that we received an Innovation Award for the demo cup at the Open World Forum which took place the 11, 12 and 13th october 2012. The demo cup consisted of presenting our open source software in a time boxed format of 7 minutes! That was a very funny and challenging exercise, especially with a jury composed of experts and an audience hard to impress. So, I made a live demo of DocDokuPLM. I started with the classical login screen, then quickly went through the document management module. I didn’t take much time on this part of the software as document management is becoming a commodity nowadays. However I explained that our DM is not as classical as it seems in the sense that it follows the PLM industry terminologies and definitions, especially those defined in the “OMG PLM services” and the STEP standards. After that, I came to what was the heart of my presentation: the DMU (Digital Mock-Up) inside the browser without any plugin. I demonstrated how we can rotate, zoom in or out and move the product model. I showed how to hide/display specific assembly parts just by clicking on checkboxes. Then I played with the layers and markers functions of our tool that allow to pin notes directly on the model. At last, I finished my demo with an impressive mashup feature that permits to publish the whole model in any blog, wiki, forum exactly like what we can do with youtube or dailymotion videos. Finally we were the first team to be called on stage to receive our prize quickly followed by Blue Mind that proposes a messaging and calendar solution and by Hippo with their HippoCMS which is a context sensitive CMS system.